One of the most important ideas discussed in my new book Brief Peeks Beyond, particularly in Chapters 2 and 9, is the notion that empirical reality – all things we see, hear, touch, smell and taste – can be understood as a nervous system. This may sound extremely counterintuitive at first, even absurd, but it elegantly solves many of the most important unanswered questions in science and philosophy today, such as the nature of matter and the so-called 'hard problem of consciousness.' The simplicity and parsimony of this interpretation of reality, together with its surprising explanatory power, render it nearly self-evident in my view. The point is so important that I decided to summarize it in this essay, so to give you a brief sense of its logic and perhaps encourage you to explore it further in the book. I will lay down the argument point by point, trying to keep it as simple as possible. Further elaboration can be found in the book. Therefore, before you conclude that the interpretation below doesn't address important empirical elements, please give me the benefit of the doubt and peruse the book. What do we know about a human brain and what do we merely assume about it? We know that measurable electrochemical activity in and across neurons correlates with contents of consciousness, like our perceptions and emotions. Many of us then assume that, because of these correlations, the brain somehow generates consciousness, even though nobody can explain how. For the sake of argument, let's leave aside the assumptions and stick to what we know. We are then left with a system that has, in the words of Lee Smolin, external and internal aspects: the external aspect is the brain we can measure, while the internal aspect consists of our conscious feelings and perceptions [Smolin, L. (2013). Time Reborn: From the Crisis in Physics to the Future of the Universe. Boston, MA: Houghton Mifflin Harcourt, p. 270]. The external aspect isn't necessarily the cause of the internal aspect, but simply what the internal aspect looks like when viewed from outside. However, the brain is merely an arrangement of so-called material particles like, say, a crystal. So unless we can make the case that the internal aspect – that is, consciousness – is associated exclusively with the particular structure of the brain, we have no alternative but to infer that the whole material universe should also have an internal aspect (this is a serious and reasonable speculation that Smolin himself has engaged in). As it turns out, honest scientists and philosophers know that we can't even coherently conceive of – let alone explain – how consciousness can come out of any particular material structure, unless it is inherently associated with all matter [Chalmers, D. (2003). Consciousness and its Place in Nature. In: Stich, S. and Warfield, F. eds. Blackwell Guide to the Philosophy of Mind. Malden, MA: Blackwell, pp. 102-142]. Therefore, let's bite the bullet and say that the whole empirical world has an internal aspect, not only brains. The visible universe is then a kind of cosmic brain: a nervous system with unfathomable inner life. 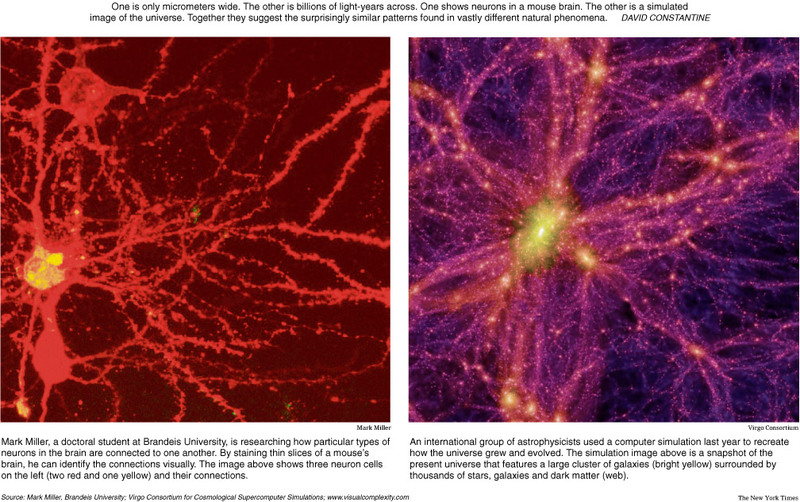 Indeed, a striking comparison published in The New York Times a few years ago shows the similarity between the structure of the universe at the largest scales and biological nervous systems (see the figure linked below). A more thorough study has shown that these similarities go way beyond mere appearances. From this perspective, the quote that opened this essay is a simple statement of fact, not a convoluted spiritual metaphor. Does that mean that a crystal is conscious? Not any more than an individual neuron in a person's brain can be said to be conscious. From Brief Peeks Beyond: "If you daydream about a tropical holiday location with trees, waterfalls and singing birds, all those images will correlate with particular, measurable patterns of activated neurons in your head. Theoretically, a neuroscientist could identify different groups of neurons in your brain and say: group A correlates with a tree; group B with a waterfall; group C with a singing bird; etc. But, based on your direct experience of what it feels like to imagine this scenario, is there anything it is like to be group A in isolation? Is there anything it is like to be group C in and of itself? Or is there only something it is like to be the whole daydreaming you – your whole brain – imagining trees, waterfalls and birds as component parts of an integrated scenario? Do you experience multiple separate streams of imagination – one for trees, another for waterfalls and another for birds – or only one stream wherein trees, waterfalls and birds are all together? Do you see the point? Unless there is dissociation, there is nothing it’s like to be separate groups of neurons in a person’s brain. We can only speak of the holistic stream of imagination of the person as a whole. For exactly the same reason that there is nothing it is like to be an isolated group of neurons in a person’s brain, there is nothing it is like to be an inanimate object" (pp. 44-45). Clearly, there is no reason to say that a rock is conscious the way you and I are. The universe as a whole has an external and an internal aspect, the rock being simply a segment of its external aspect, like an isolated neuron is a segment of a brain. Unless we have good reasons to think otherwise, we must assume that – just as our own inner life – the internal aspect of the universe is a unified stream of consciousness; 'God's dream,' so to speak. The empirical world we perceive is like a 'scan of God's brain' while dreaming. Creation is the external aspect of 'God's' creative mental activity, just like an active brain is the external aspect of a person's inner life. So there you go: a simple, parsimonious and, dare I say, elegant and powerful explanation for the most vexing questions facing science and philosophy today. Most significantly, this explanation is not arrived at by adding new theoretical entities or postulates, but precisely by getting rid of unnecessary and inflationary theoretical entities and postulates that have clouded our understanding of reality for centuries now. It's time we cleaned up the house and restored reason and empirical honesty to our ontology. It's time we saw a postulated material world outside consciousness – which, absurdity of absurdities, allegedly generates consciousness – for what it is: the tortuous fiction of confused minds. * Nisargadatta Maharaj, S. (1973). I Am That. Mumbai, India: Chetana, p. 58. The italics are mine. Having gone that far, one must next entertain the storyline.. the framework... as to what kind of ordeal this Cosmic Consciousness is undergoing that would necessitate having to fragment into all of these dissociative alters...? Why would "God" be having to experience what we call Dissociative Identity Disorder in the first place...? And what does this suggest about the unfoldment of the Cosmos and our place in it...? And, having gone this far, what universal "ethic" might be implied through our place in such a universe...? I explore much of this in my books. The answers, however, are always partial and tentative. These are perhaps the biggest questions of existence. This essay has been significantly updated as of 14 April 2015, 19:20h CET. Very interesting stuff! I'll be pondering these ideas for a while. Interesting. The explanation I've always liked best is that "God"--or "All That Is" or whatever label you're comfortable with--manifested in this way so that He (I'll use this pronoun for the sake of ease) could experience Creation through a billion different lenses. Sort of like we get to experience ourselves and the world through our child's eyes when we have children. Maybe also to experience bonding, which can only be done if things are separate to start with. Maybe to forget for a while and experience the awe of life all over again. Who knows. I've enjoying perusing your ideas so will definitely pick up your book. i was struck by that quote and have read and re read it over and over again. i most certainly will be picking up a copy of your book. It struck me too! Thanks Jack. Great summary. Question for you: if the physical brain is simply a localizing mechanism for consciousness, what is to keep a non-biological pattern producing machine (like a computer) from localizing consciousness? If the biological brain does not produce consciousness, what makes it so special and distinct from man-made non-biological information systems? Think of it this way: biology is simply what localization -- dissociation -- *looks like* in the 'scan of God's brain,' which is the empirical world itself. It is the image of consciousness localization, not it's cause or source, in exactly the same way that a whirlpool doesn't cause water. Now, does a computer look like biology? At a high abstraction level it *emulates* a brain in terms of information processing, but it still doesn't look at all like a biological brain. Why would it be the image of localization? What reasons do we have to believe that? You see, we should never mistake a simulation for the thing itself. 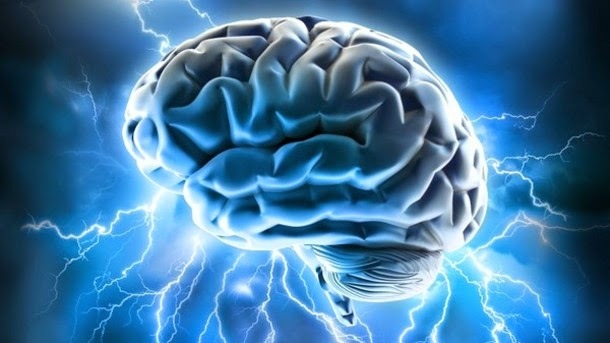 The computer simulates information flow in biological brains. But to say that, because of that, it too is a localization of consciousness is somewhat akin to saying that a software simulation of kidney function should make your computer pee on your desk. "For the Kabbalists, evil emerges out of separating things that should (and necessarily do) remain united, a "splitting" of a deeper unity. It was as if the universe itself had been subject to a cosmic "dissociative reaction," in which the underlying unity of the universe had been fragmented into a multiplicity of selves. Both the kelipot and affect-laden complexes become relatively inaccessible to consciousness, shrouded in the darkness of the unconscious." "... We know that measurable electrochemical activity in and across neurons correlates with contents of consciousness, like our perceptions and emotions"
If it's not generating (aspects of) consciousness, what do you think all that electrochemical activity is actually doing? I kind of got hung up in section 1, where you end by saying: "The external aspect isn't necessarily the cause of the internal aspect, but simply what the internal aspect looks like when viewed from outside." The way I see it, an inside (me) is looking at another inside that that inside isn't normally aware of. Take the case where an inside (me) is looking at my own brain scan. I'm not seeing anything from outside: I'm an inside seeing inside my own inside in a way I'm normally unaware of. Never for a moment am I straying outside my own inside. As for "someone else" looking at my inside, it's simply *his* inside seeing my inside in a way he normally can't. He too never ventures outside his own inside. *Everything* is inside. There *is* no outside. There's stuff that is known to me, and stuff that is known to an apparent other, and it's this feeling of knowing different things that gives us a sense of separation. In reality, we're just *perceiving* different things. Not sure I've put that across too well, but the thought stopped me in my tracks and I couldn't go any further with your argument. To clarify, when I said "In reality, we're just *perceiving* different things", I of course didn't really mean "we". I meant two *apparently* separate entities, apparently separated by knowing different things. Maybe that's a little clearer? I don't disagree with you at all. It's all inside the one consciousness, or mind at large, or 'God.' But consciousness has many processes unfolding within it (thoughts, feelings, imagination, etc. ), some of which become dissociated from the rest. You and I are dissociated processes of this mind-at-large. So, __from the point of view of a dissociated alter__, there is an outside. But this 'outside' is outside the alter, not outside consciousness. Similarly, from the point of view of a particular personality in a person with DID, there is a 'space' of the person's psyche that feels 'external' __to the personality__. Everything, however, in still inside the same psyche. You state that your position is more parsimonious than realism because it does not require postulating a whole universe outside of consciousness, but on the other hand, your position is no more parsimonious because it does require postulating an internal aspect of the empirical reality for which we have no evidence. Moreover, what interests me primarily is the question of an afterlife: what happens to our inner side when our outer side is destroyed? How do fit here NDEs, apparitions of the deceased or mediumship? 5- 4 is more parsimonious than materialism because it does not require postulating a universe outside mind: both internal and external aspects are experiences, and do not require anything beyond experience. As for the after life, I would speculate that it involves a transition of our experience of the universe from a second-person perspective to a first-person perspective. The end of dissociation entails a reintegration of our localized flow of experience with a much broader and unified flow. Granted, this assumes that there are no undetected levels of dissociation between being a human and being the whole universe. If there are gradations in between, then death may entail a 'fall back' to a different level of dissociation/localization. For this later speculation, however, we have no direct empirical evidence beyond some NDE reports. 5- 4 is more parsimonious than materialism because it does not require postulating a universe outside mind: both internal and external aspects are experiences, and do not require anything beyond experience." Now I think I get you; and I think you might be saying the same thing as I am. All there is comprises different aspects of reality as experienced from "internal" perspectives. Unfortunate word, that, because it automatically brings to mind its opposite, "external". There *is* no external; just that which experiences. Some of what is characterised as external is shared experience, albeit quite often interpreted differently according to different perspectives. Different perspectives constitute what are usually thought of as separate entities. "You" experience separation from "me" (and vice-versa) insofar as "we" have different perspectives on reality. Each of "us", if you like, is a dissociated aspect of All There Is that experiences things in different ways: in fact it is the experiencing in different ways that creates the illusion of separation. Spiritual experiences are marked by varying degrees of the sensation of unity, of being part of a larger whole. To some extent or other, "we" are capable of overcoming the sense of separation. Look at it this way: All There Is, for whatever reason, decides to explore Itself; decides to play hide and seek with Itself (as in Alan Watts' story "What to tell children about God"). How can it do that if it knows everything there could possibly be to know? Well, one way is by dissociation into apparent entities that are limited in what they know by dint of their different perspectives. There might be some broad areas of agreement, as in shared understandings of reality, but still, each dissociated perspective ordinarily has a sense of individuality. "As for the after life, I would speculate that it involves a transition of our experience of the universe from a second-person perspective to a first-person perspective. The end of dissociation entails a reintegration of our localized flow of experience with a much broader and unified flow." Yes: we are no longer as hidebound by the grand illusion. What you're calling the "first-person" perspective is what I think of as a larger perspective, if not the (one and only) first-person perspective of All There Is (I'm allowing here for a degree of evolution, possibly over many incarnations). "Granted, this assumes that there are no undetected levels of dissociation between being a human and being the whole universe. If there are gradations in between, then death may entail a 'fall back' to a different level of dissociation/localization. For this later speculation, however, we have no direct empirical evidence beyond some NDE reports." Yes. Different levels of dissociation associated with different degrees of evolution: I think that's probably true. And, maybe, "evil" is simply greater degrees of dissociation. I think you're right that this is more parsimonious than materialism, but it is something that is very hard to express whilst avoiding using words that reflect the way we usually think about things: words like "you", "me", "internal", "external", "empirical reality", and so on. Once you grasp it, you don't see the world in quite the same way. I will avoid speculating about attributions of self-reflective intent or premeditated action on the part of mind at large, or 'God.' For all I know, the formation of alters is entirely naturalistic, i.e., it's simply what happens in mind at large due to what it inherently is. There is a discussion about this in the chapter about free will of Brief Peeks Beyond. I don't think what I just said refutes the free will of mind at large, but avoids anthropomorphizing its actions. Yes, when I say 'outside' I mean outside the dissociated alter, not outside consciousness or mind at large itself. Think of it in the same way that, from the perspective of your thoughts, your emotions often feel alien or external ('Why the heck did that make me angry? There is no reason for it...'), and the other way around. Yet, it's all in the same psyche. The entire force of my argument is precisely to say that there is __nothing__ outside mind at large. Okay, Bernardo: suppose there's no intention in greater consciousness. For all we know, it might just be the way things are. That kind of implies that "God" is in process of evolution and subject to naturalistic laws that are the *actual* primal reality; laws for which there is no explanation of why they might exist. The objection to thinking anthropomorphically is that it's an inappropriate category error. But what if the universe is "deomorphic", and anthropomorphism is a reflection of that at a lower level? As above, so below, as they say. Then the explanation is more or less self-explanatory: the universe is conscious, and so acted in a conscious way by exercising its maximal free will. At some stage, it chose to express itself in a dissociated manner, and fashioned Laws to facilitate its eventual rediscovery of itself. Otherwise, the Laws would be primal and consciousness simply emerge in some way. To me, that sounds like a version of materialism. I agree that, in one way or another, the universe "chose to express itself in a dissociated manner." But the question is how this choice was made: was it self-reflective and premeditated like a person choses her route to work, or instinctual and driven by archetypes like a moth chooses to go to a flame? The former is the anthropomorphization, while the latter is still "deomorphic." When you say that the universe "fashioned Laws to facilitate its eventual rediscovery of itself" I think you are inevitably attributing premeditation and self-reflection to mind-at-large (God, the universe, etc. ), which, in my view, is not obvious or necessary. It could be that natural laws weren't 'chosen' as such, but are simply the expression of what mind-at-large inherently is; that is, its fundamental archetypes. Similarly, neurotic people don't self-reflectively choose to be neurotic; they simply manifest their psychic archetypes. I am not saying that you are wrong, just that what you suggest isn't necessarily an implication of the view I'm putting forward. Thanks for your reply, Bernardo. I hope I'm not appearing argumentative for the sake of it; I'm merely trying to follow through the implications of your view. Correct me if I'm wrong, but I think you're saying that mind-at-large isn't premeditative; that, in a sense, it has a "subconscious" dimension, which is the origin of phenomenality--and maybe no "conscious", or at least *rational*, dimension at all. It's as if (at a lower level), our primal urges and desires could be expressed as apparently concrete realities: we could cause things to apparently become simply through possessing those urges/desires. Because we can't seem to actually do that at our dissociated level, we have the tendency to think it can't be done at all. So: am I right in thinking it's your view that the things mind-at-large causes to become apparently have the potential of developing what we think of as rational, conscious awareness--which is something that it itself doesn't possess? Expressed somewhat differently, maybe it's only through creation that it experiences (the inferior faculty of) rationality, almost in passing. That would make rationality, that faculty you and I are exercising in this discussion, a novel, emergent phenomenon that expresses a capability that heretofore mind-at-large didn't possess: it's through us that it is exploring the world in this (inferior, but still useful) way. To us, rationality appears to be at the summit of awareness, but on reflection, rationality never provides definitive answers: I suppose mathematics comes closest, but even there--as I understand it at least--Gödel showed it has its limitations. Rationality is the tool we use to try to explain the world, but it always falls short, and that will always be the case, however useful its results. It's rather strange to think of rationality as being an imperfect tool; something that is, in the end, inferior to the "subconscious" mode of action of mind-at-large. I know it's frequently said that Truth lies beyond all attempts to understand it rationally, but do we actually accept that? I don't think so: we ceaselessly carry on trying to make rational sense of it. Until...what? Maybe until we have some kind of transcendent experience, e.g. as reported in NDEs, psychedelic experiences, and so on. Words always fail those who return from such experiences; it's simply not possible to describe them in rational terms. At best, rationality provides a rough approximation of that which is the case, and it so happens that in certain circumstances, human beings have the capacity to directly perceive something of the nature of mind-at-large. At some point, rationality breaks down; I suppose the most obvious example in physics is of quantum phenomena, which could be thought of as transcendent experiences that can, unusually, be reliably and repeatedly demonstrated. They're telling us there's something at the very basis of the phenomenal world that simply can't be rationalised. Rationality has taken us to the point where it fails to explain itself, and that's when we start telling ourselves to shut up and calculate. And so it is with spiritual and psi phenomena: if we shut up and calculate all the time, then we tend to become materialists, ignoring the elephant in the room. I would fully agree with this if we replaced the word "rationality" with "self-reflection." Self-reflection is the capacity that allows you not only to know something, but to know *that* you know it. As such, it applies not only to rational thoughts but also affections and intuitions: we are uniquely self-reflectively aware of our emotions, gut feelings, and even perceptions. So yes, I think dissociation at the level of mind-at-large -- i.e. biology, metabolism -- is intimately linked with self-reflective capacities, this being the meaning of life. I think mind-at-large may (I don't have a definitive position here), MAY be purely instinctive and not self-reflective. Or there may be multiple, gradated, ordinarily invisible levels of self-reflective structures between life-as-we-know-it and oceanic mind-at-large. I don't know. But I would be surprised if, at the most basic and fundamental level, "God" were self-reflective and Its behavior premeditated. Thanks, Bernardo. I now understand your position better. I won't say that I agree or disagree with it; what I will say is that it has caused me to see a new possibility I hadn't really thought about before. I see that the Kindle version of your book will be coming out late in May in the UK; rest assured, I shall be buying it as soon as it becomes available. Bernardo, can you explain why you would be surprised if "God" were self-reflective? The argument is doubtful because it is based on ignorance, not knowing why brains have an inner side. And physicalism is equally parsimonious because it does not require anything out of the physical; consciousness could be physical despite not knowing how. "If there are gradations in between, then death may entail a 'fall back' to a different level of dissociation/localization. For this later speculation, however, we have no direct empirical evidence beyond some NDE reports." I disagree. As evidence of localized states of postmortem consciousness, there are cases of aparitions of deceased, mediumship and people seem to remember their past lives. I would develop a conception of the afterlife basing on that evidence, instead of trying to bring the evidence to a preconception. >> The argument is doubtful because it is based on ignorance, not knowing why brains have an inner side. We know _that_ a brain has an internal aspect. That's all the argument needs. We have failed, even _in principle_, to explain experience on the basis of _particular_ arrangements of matter, this being the hard problem of consciousness. The burden is on physicalists to explain, at least in principle, how mass, charge or momentum could, under particular arrangements, create experience. No one has ever come close to it. The burden is not on me to prove that it cannot, since my very position is that the idea that consciousness arises from particular structures of matter is idiotic and reflects profound confusion. The burden is on them. Until they manage to do it, one must assume, on the basis of undeniable empirical evidence, that the universe as a whole is also the image of an integrated stream of consciousness. I think I exhausted this point now, so won't repeat it. >> And physicalism is equally parsimonious because it does not require anything out of the physical; consciousness could be physical despite not knowing how. This is incorrect. At the very least the physicalist must postulate consciousness to be an EXTRA property of the physical in addition to e.g. mass, momentum, spin, charge, etc. By the very definition of the other properties of the physical (again: mass, momentum, etc. ), consciousness is NOT those. So more needs to be postulated. At the same time, consciousness is self-evident, so when a physicalist postulates that there is something beyond consciousness (e.g. matter outside consciousness) he is always less parsimonious. This isn't in dispute by any philosopher. What is in dispute is whether one can explain all empirical phenomena with consciousness alone. The bulk of my work is precisely about this. "At the very least the physicalist must postulate consciousness to be an EXTRA property of the physical in addition to e.g. mass, momentum, spin, charge, etc. By the very definition of the other properties of the physical (again: mass, momentum, etc. ), consciousness is NOT those. So more needs to be postulated. At the same time, consciousness is self-evident, so when a physicalist postulates that there is something beyond consciousness (e.g. matter outside consciousness) he is always less parsimonious." Only dualism is less parsimonious, by other hand it does not mean it's not true. Physicalism is a monism, so is as parsimonious as idealism. Consciousness can be physical although it is not among the properties of the microphysics. Matter, in the everyday sense, is self-evident in the same way. In this post there is criticism that I consider correct, such as the error of an approximation too "top-down" or not to examine specific cases of apparitions and mediumship. Besides your stance rejects the possibility of postmortem communication, because death is conceived like waking from a dream, and awakened no longer interact with their dreams, but this I think it is wrong for some cases of mediumship. "For this to work, a monistic materialist must effectively deny that consciousness exists at all." No, eliminative materialism is not the only option for the physicalists. The property of being a square is not in microphysics, and by no means the physicalists must be eliminativists about that property. Also you missing the rest of my previous comment. Juan, I refrained on purpose from commenting about the rest. I don't feel I have much to add to arguments about evidence from psi phenomena. I am not an expert in the research. As for the other option you allude to, it's called emergence. But emergence doesn't work for consciousness because the property of being conscious is not deducible, even in principle, from the properties of matter. See David Chalmer's 'Strong Emergence' discussion. I've discussed the incoherence of consciousness as an emergent property of brains in many places, not only in my books. Basically, the appeal to it is an appeal to magic, the labeling of an unknown. It means exactly nothing, because nobody can explain how it works, not even in principle. They just gave it a name. OK, maybe one brief comment: yes, I see death as akin to waking up from a dream. But I also see all reality as comprised of mental processes unfolding in one only mind, which I call mind-at-large ('God' in this particular essay). From that perspective, all processes unfolding in mind-at-large can, at least in principle, interact with one another. So I do not discard communication with so-called 'discarnate entities,' if they exist, as impossible. But all we appeal to magic to take something as primitive. That is true in a sense. But materialists then appeal to magic twice: by taking matter as a ontological primitive, and then by simply assuming (without elaborating) that consciousness arises from matter. Idealism just grants what is self-evident, whether 'magical' or not: consciousness exists. You keep showing materialism as dualism, when it is not dualism. It is also self-evident that matter, in the everyday sense, exists. For as long as the hard problem of consciousness isn't solved, at least in principle, materialism necessarily implies either substance dualism or property dualism, yes. This is my position and I explained why it is. Matter self-evidently exists solely as a modality of experience. It isn't at all self-evident that matter exists outside experience. I hope you will come to Skeptiko forum thread I mentioned and respond on it - but, if you have no intention to patricipate there, I'll be glad to see your response right here as well! Hi Vortex. I may write an essay on AI some time soon, but after a quick glance at that thread, I feel like rolling my eyes back. A paper claiming artificial consciousness has been created a year ago? Too much bull for my tired heart. :) I don't think I will jump in. I am a guy who very recently got interested in nonduality and the philosophy behind it, and I love your work! I have already ordered two of your books, and I will probably read at least two more after reading the first two. However, even though you might have written about this in your books I would like to ask you about how our consciousness create reality. If I understand your ideas correctly, there is basically some sort of collective consciousness that creates the universe as we know it, right? However, we know that there are quantum particles in this simulation of ours, that we can "collapse" by observing them, right? So, why have they not already collapsed? If they are created by the collective consciousess at the bottom of the universe, why do they need the consciousness of specific human beings to collapse? You might already have mentioned this is a podcast, and I might simply just have forgotten about it, but please explain this or point at an article where you explain it. Ps. I haven't read this article, so please tell me if you explain it here. I can't focus on reading this late in the evening I'm afraid. "And thus the question 'How do you know that the external world exists?' translates into the self-contradictory absurdity of the question, 'how do you know that you are conscious?' To deny the external world is to deny the existence of consciousness. But then who is doing the denying and by means of what faculty?" I never read Rand. She's generally discredited in philosophy, which in itself doesn't mean she's wrong, but it means I never prioritized reading her work. And frankly, I don't think I ever will, after the quote you just provided. It is so obviously flawed, for the reasons your point out, that it flirts with being outright ridiculous. I've just ordered your latest book after reading your piece on AI and this article. I am curious about your thoughts on cyborg theory. Specifically, in your framework how might a dissociated alter's experience be enhanced by advanced information processing speeds such as we might "birth" into existence through quantum computers. How might a cyborg-like enhancement of cognition transcend the basic experience of a living being? I wonder about the possibility of transcending our perception of "time," through such advanced processing. Or how might faster processing enhance cognition and therefore augment the self-reflection capacity of living beings? Hi John. I hope you enjoy the book! In my view, these kinds of enhancements can be seen at best as new, artificial sensory modalities beyond the five usual ones, nothing more. Short of that, they can be compared to ordinary instrumentation (e.g. telescopes, microscopes, etc. ), which has been aiding our existing sensory modalities for millennia. Cheers, Bernardo. 1. Is it just an accident that the thoughts of god looks like stars, planets, oceans, rain, and all the other things that we actually need to live? Could god have said:"Hmm, my thoughts should look like a sweater." Maybe there are other dimensions where God's thoughts look completely different? 2. Could there conceivably be a world where the universe is the actual content of the thoughts of god, and not only what the thoughts of God look like from a second person perspective? I apologize if I asked questions that already have been answered; I felt that I just had to write down these thoughts before I forgot them. Hi Sebastian. (1) Can you purposefully think a thought so the create a pattern of firing neurons in your head looking like, say, a butterfly? I guess not. :-) So I think mind-at-large doesn't know what its thoughts look like from our perspective. It just thinks thoughts related to abstract symmetries, which we find back in microphysics. (2) Yes, but in that world there would be no dissociated alters like you and I, just one unified mind having one dream. It would be a dream of one, for one. Hi Bernardo, Could I sound you out a bit about your differences with MBT? I've heard you say that you don't like the idea of this reality being a kind of kindergarten since why would we not have access to memories of past lives that could help us, etc? Hope I am paraphrasing correctly. Tom Campbell's reply to those points (since they often come up in his Q&As) is that it's about "sculpting a soul" (he doesn't use that term) through it's many incarnations and that the knowledge of past lives would not help but actually hinder the incarnation at the "being level" since the info would tend to be used at the intellectual level to try to avoid past mistakes, etc. The being level carries over to future incarnations but not the intellectual level. For instance, suppose you were a particularly selfless person in a previous life and you really nailed it, so you know how to do that. Maybe in your next life, you would come back as someone born into great privilege so you could actually learn how to be selfish, etc. Thanks. This is a very interesting essay. I came to your website through the recommendation of a friend. This piece seems as though it may be a reasonable summary of your overall position? If there is a more comprehensive piece online, let me know. I have a few questions that come to mind; I am sure some of them have been asked in other places, so my apologies if I'm being redundant. First I will try to summarize your position (to make sure I am understanding you correctly), and then I will raise my objections. 1) You propose that the “whole empirical world has an internal aspect, not only brains”. By this I gather you mean that consciousness exists throughout the whole empirical world. You see this as the simplest solution to the problem of how consciousness can exist within the matter of the brain. a) Human consciousness involves multiple material elements in concert, i.e. different regions of the brain. b) Consciousness is not divisible between these regions, rather it exists as an integrated experience of the whole brain. When you say “there is nothing it is like to be an isolated group of neurons in a person’s brain”, you mean that consciousness cannot be ascribed to an isolated group of neurons in a person’s brain. Rather, it can only be ascribed to the brain as a “whole”. c) You analogize from the brain to the “whole empirical world”. Just as consciousness cannot be ascribed to isolated parts of the brain but must be ascribed to the brain as a whole, consciousness also cannot be ascribed to isolated parts of the universe but must be ascribed to the universe as a whole. 3) You conclude that the physical universe is merely the external aspect to the internal aspect of cosmic consciousness. You clarify this position to mean that the physical universe is merely the appearance of cosmic mental activity. In other words, there is no material reality, there is only cosmic consciousness. You say “we do not need to postulate a... material universe outside consciousness”. 4) You justify the sense we have of separate human consciousnesses in the universe through an analogy to multiple personalities in a brain with dissociative identity disorder. i) “…there is nothing it’s like to be separate groups of neurons in a person’s brain”. Objection 1: Let us define a group of neuron’s as follows: all the neurons in somebody’s brain except those in the amygdala. Now let us isolate them by removing the amygdala. Some individuals have undergone this form of brain damage (that is, the removal of their amygdala), and these individuals were still conscious. Therefore we can ascribe consciousness to an isolated group of neurons. In other words, there is something it is like to be some isolated groups of neurons. ii) “Just as consciousness cannot be ascribed to isolated parts of the brain but must be ascribed to the brain as a whole, consciousness also cannot be ascribed to isolated parts of the universe but must be ascribed to the universe as a whole” [My summary of your position]. Objection 2: If consciousness cannot be ascribed to isolated parts of the universe, and since brains are isolated parts of the universe, then consciousness cannot be ascribed to isolated brains. If consciousness cannot be ascribed to isolated brains, then it does not seem to make sense to say that consciousness can be ascribed to the brain as a “whole”. The foundation for your analogy (the consciousness of a “whole” brain) has thus been negated, and so it no longer makes sense to premise it as an analogy for consciousness of the “whole” universe. In other words, I do not see this as a good argument for accepting a single unified consciousness instead of many separate consciousnesses. iii) “There is no material reality, there is only cosmic consciousness” [My summary of your position]. Objection 3: A brain’s neurons do not depend on the consciousness of the brain for their existence. We see that this is true because neurons exist in a deceased person's brain, even though the deceased person's brain has no consciousness. Just as neurons exist without the consciousness of a brain, by analogy material reality could exist even in the absence of the consciousness of the universe. Therefore, we cannot say that material reality is dependent on the consciousness of the universe. In other words, I am unable to see how your argument can explain away the necessity to postulate a material universe. Thanks for taking the time to read through this. I hope my challenges are interesting and not redundant, and that you can clarify if I have misunderstood anything. I'm looking forward to reading your response. Thanks Thomas, but I can't get into detailed philosophical discussions; at least not here. You can try my forum, where several others may also react: https://groups.google.com/forum/#!forum/metaphysical-speculations. You can also check my papers for a much more detailed argument: http://www.bernardokastrup.com/p/papers.html. In this particular paper I address many objections to my argument: http://www.disputatio.com/wp-content/uploads/2017/07/Kastrup_On-the-Plausibility-of-Idealism.pdf. Thank you Bernardo, I will look through your papers.